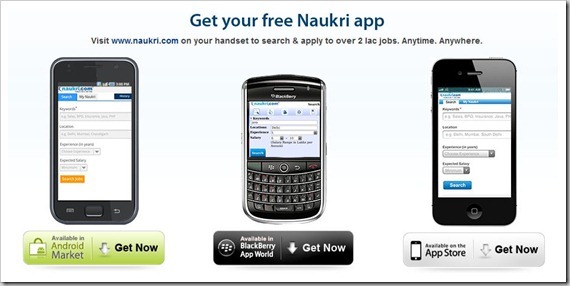 Naukri has finally launched dedicated mobile apps for its Job search engine. Being the biggest Job site in India, they should have come up with these apps earlier – However, its better late than never :). From the looks of the apps they have released, they have done a good job of it. 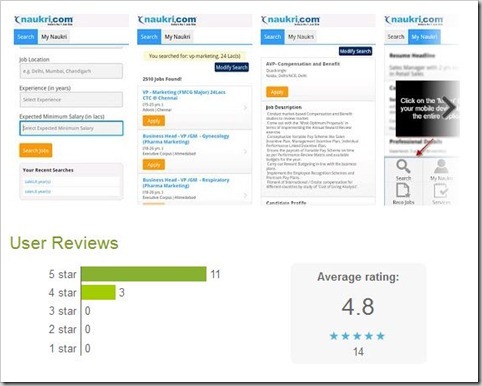 TimesJob was one of the first Indian job search engines to introduce their apps for iPhone and Android based smartphones, however, they have not been too popular. Even after close to 6 months of launch Timesjob Android app has not crossed 50k downloads, whereas iPhone has witnessed even lesser. Even the user ratings and reviews have not been that good. We downloaded Naukri.com Android app on our phone and found it to be quite good. Even other users who downloaded the app have given excellent ratings. In less than 2 weeks since its launch, Naukri Android app has witnessed between 10k to 50k downloads and users have rated it 4.8 on 5! As far as the features go, Naukri apps have all the standard features expected – The app allows job-seekers to filter job openings by location, keywords, functional area, experience bracket, and minimum expected salary. App also allows users to create up to five custom job alerts based on defined search criteria. The alerts are directly sent to the users’ inbox three times a week. Users can also track the number of times a resume has been viewed by an employer, and the companies they have applied to earlier. Apart from these smartphone apps, Naukri also has launched its own HTML 5 site, which allows users to search jobs from a mobile friendly interface, when using Naukri site from a mobile browser. All in all, Naukri has launched decent apps and they surely should be popular with Indian job seekers. If you are looking for a job switch, download this app and let us know what you feel! As an aside — It’s interesting to see that many big sites haven’t yet come out with WP7 apps. Perhaps the visitor stats don’t reflect enough marketshare..
having worked at naukri's product development teams, I know they are a bunch of smart people! good luck to them!